Before meeting Mob, Teru didn't know any other espers, so he greatly overestimated his own importance and power. This is likely due to Claw only sending artificial espers to try and "recruit" him. He was very popular and often strategically used telekinesis to benefit himself. For example, he threw nothing but strikes the first time he went bowling. He considered himself the main protagonist of the world. 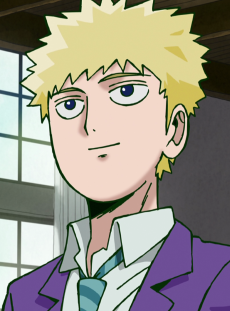 Since his defeat, Teru comes to realise that the world does not revolve around him, but he is still confident in his strong and diverse psychic powers. He seems to adhere to Mob's policy of not using psychic power against people unless absolutely necessary. He is motivated to stop others from succumbing to pride like he once did, but he is still concerned about his outward appearance and still seeks perfection in all his endeavors. He has been known to hold people upside-down and dunk them in a bucket of water until they tell him what he wants to hear. While he is noted to be a good leader, he is shown to has trouble remaining humble, and often still has a confident tone in his voice which still lingers even after his defeat by Mob's hands. The shock of defeat seems to give him a fever.